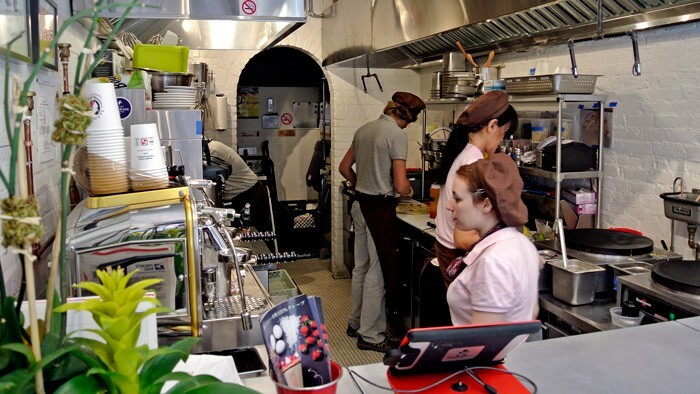 If you’re in SoHo, perhaps shopping, where do you stop for a quick, easy lunch? There’s plenty of trendy, pricey sit-down cafes in the neighborhood, but you have to look a little harder to find something fast, casual, and actually good. I had heard about a great new Harajuku style Japanese crêperie in the area and knew I had to check it out. Do I sense a Harajuku mini-trend happening in NYC? 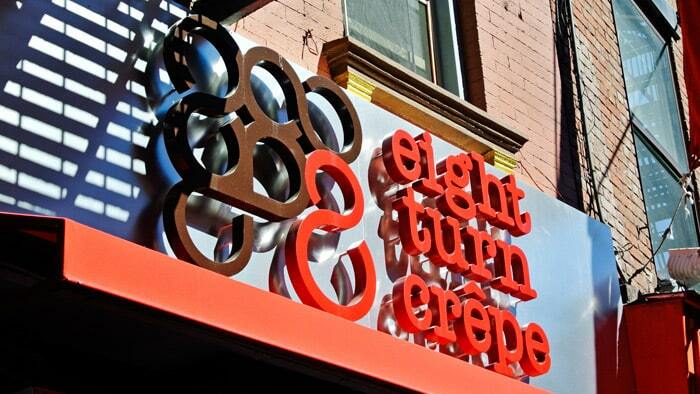 Situated in Nolita on a strip of Spring Street just a block from the shopping chaos on Broadway, you’ll find Eight Turn Crêpe. It’s a tiny hole-in-the-wall Japanese style crêpe shop with decor that definitely feels strange in the, you know, Japanese kind of way. 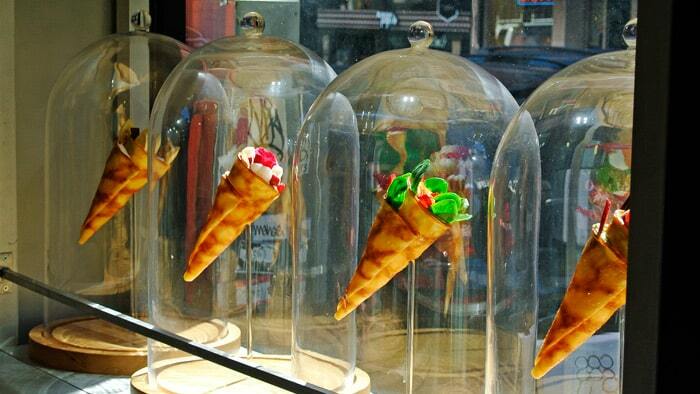 The front window is filled with levitating crepes in glass cases that kind of remind me of the Beauty and The Beast enchanted rose. Also, oddly enough, they decided to open this shop only two doors down from an established French crêpe shop, Vive la Crêpe. Maybe one day I’ll return to this block for a side by side comparison. 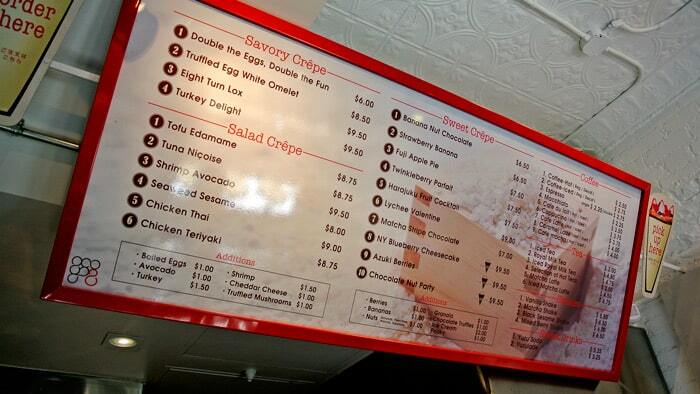 The shop offers many varieties of crêpes including savory, sweet, and “salad”. I arrive just past noon so I limit my menu choices to the savory and salad sections. I find myself immediately drawn to the Truffled Egg White Omelet Crêpe in the savory section and Shrimp Avocado Crêpe in the salad section and let the cashier make the decision for me. She strongly suggests that I pick the shrimp and avocado crêpe, so that’s what I do. I watched as they first make the rice flour crêpe on the flat disc-shaped grill then carefully assemble the fillings before rolling and handing me a neatly wrapped, fully loaded cone. I really appreciate how well they distribute the fillings evenly through the different layers of the crêpe cone. This attention to construction allows each bite to contain all of the flavors and textures at once, which by the way are really excellent. The sauces taste distinctly Asian due to the chili Thai and wasabi tofu sauces. There’s a subtle spiciness at first that definitely creeps up on you especially after the sauces pool at the bottom of the crêpe. The shrimp are snappy and the avocado wedges, baby spinach, julienned carrots, and red pepper are bright and fresh. It all comes together in a very light, refreshing, but flavorful and satisfying way. 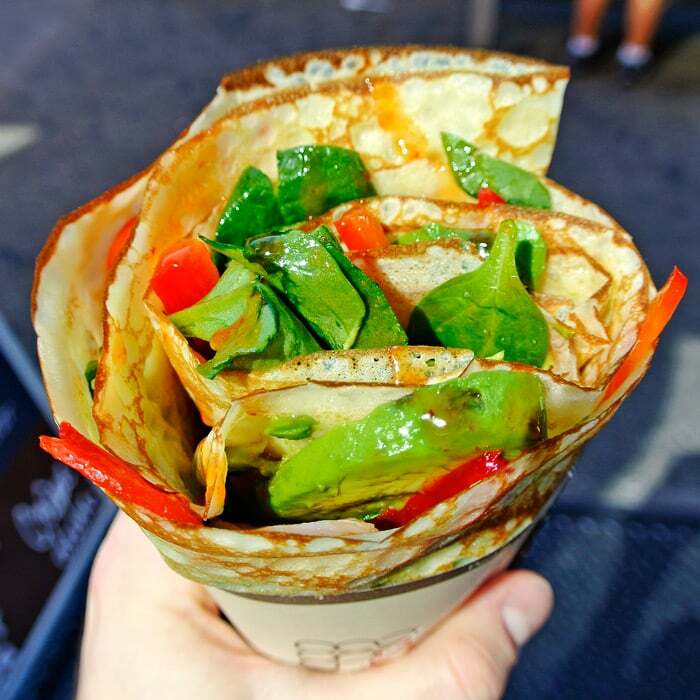 I think some people might find the prices a bit high for a crêpe, but if you want something in Nolita that is delicious and also on the healthy side on the spectrum, this is a great spot for an excellent meal on-the-go.